Georgia agribusiness weathered a tough year – and then the heavy spring rains came. Here’s a look at some key sectors and how they fared. After several years of on and off drought conditions, Georgia farm-ers saw 2009 unfold with seemingly unending rains that kept them out of the fields during the critical spring planting season. The warm, wet weather that followed created ideal conditions for bugs and fungi to spread their attacks on sprouting plants. More threats to a profitable year for important cash-generating commodities such as peanuts, poultry and, in one case, tomatoes, came far from the fields and were credited to the global economy and health scares. Still, some sectors of the ag economy continued to grow, even prosper, providing a bit of balance for the agribusiness profit and loss sheet. The back-story here is the change in the nature of the state’s farming operations. Big farmers are getting bigger and the number of small farms is growing, particularly in north Georgia. The state’s organic farmers are becoming modest players among the giants of the land. Here’s a look at several agricultural sectors and a few noteworthy trends in the industry that is the state’s largest revenue producer. The U.S. Department of Agriculture’s most recent census indicates that the number of small farmers whose primary income is earned away from the farm rose by 9 percent between 2002 and 2007. Some farm owners may use the land to raise and enjoy horses, but there are small farmers who use their north Georgia land strictly for profit. “When you are on high-value land and you don’t have a lot of land, say, like north Georgia, if you want to make a significant income from that land you have to have a high-value product per acre,” McKissick says. In fact, Georgia’s fledgling organic farms are just beginning to flex their muscles and have begun ambitious programs to put more of their members at the table and more of their crops on it. Rolls cites increases in the use of organic fruits and vegetables in upscale restaurants and a growing consumer demand for the chemical-free products at fresh markets around the state as evidence of those opportunities. She believes the cost burden of petroleum-based products used in conventional farming will nudge more and more farmers toward organic farming. Mac Abel stands at the edge of his pecan orchard watching dark clouds gather over the western horizon and ruefully shakes his head. “What we certainly don’t need is more rain,” says Abel, the third generation in his family to operate Mockingbird Hill Farms, 700 acres of pecan trees in Dougherty County. Abel’s trees have been drenched by steady spring rains. The wet weather combined with the warm days of late spring and summer creates ideal conditions for the spread of scab, a fungus that attacks the leaves and fruit of his pecan trees, and that, he says, will hurt his bottom line. After a long drought, it seems odd for a grower to complain about rain, but, “I’ll take a drought over all this rain anytime,” he says. Georgia’s pecan industry recorded $158 million in farm gate value in 2007 to those, such as Abel, who harvested the nut. About 80 percent of the world’s pecan production is in the United States; Georgia is the nation’s largest producer. Abel’s orchards sit in the middle of the industry’s most productive counties. Even without the rain, pecan trees can be fickle nut bearers, producing bumper crops every other year at best. “Pecans are probably the hardest crop to produce in the state of Georgia, and probably the most expensive crop to produce,” Abel says. While Abel was speaking, Hilton Segler was packing his bags for a trip to Atlanta to meet with a delegation from Vietnam interested in importing pecans to that country. Segler is a former grower who now serves as president of the Georgia Pecan Growers Association, and he has meetings scheduled later in the year with delegations from India, South Korea and Brazil, all looking to put the nuts in the kitchens and stores of their countries. Pecans could be called the “quiet crop” because they seldom get media attention, and their sales value, when weighed against other Peach State crops, is relatively small – only about $220 million in 2007 when the industry recorded a record harvest of more than 150 million pounds. “We had a record crop,” Segler says. “But so did every other state from North Carolina to New Mexico.” Unfortunately, the flooded market kept prices down. 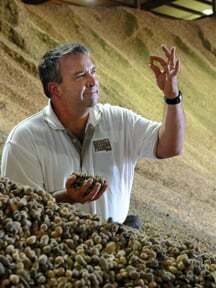 The peanut outlook was made cloudier by persistent spring and summer rains just as planting had begun, says Don Koehler, executive director of the Georgia Peanut Commodity Commission. In the economics of farming, a reduction in production is just the right prescription for the ills caused by the previous year’s oversupply. “We had a phenomenal year last year and so we needed to trim back a little bit to get the market back in equilibrium,” Koehler says. In other words, the heavy rains earlier this year that kept the farmers out of the fields were good for the market value of their peanuts in the long run. One effect of the misnamed flu scare was a diversion of marketing dollars into a defensive stand by the National Pork Board, an industry promotional group. “For three weeks, they had to change all their advertising into a “Pork is Safe” campaign,” says Griffin, and that had an effect on Georgia’s at-the-farm annual pork sales of $90.4 million. Another Georgia commodity took a hit in 2008, again generated by the fear of disease that in turn sent sales into a free fall. This time it was tomatoes in salsa identified as the source of a salmonella outbreak in 17 states. Though initial reports from the Federal Drug Administration (FDA) and the Centers for Disease Control and Prevention (CDC) cautioned that not all tomatoes posed a threat, the panic button had been hit and fast food chains quickly took tomatoes off their menus and buffet lines, while tomato sales in supermarkets plunged. When tomatoes became taboo, Georgia tomato growers and related businesses lost $25 million, says Gary Black, president of the Georgia Agribusiness Council. The event led Black to write an angry op-ed column denouncing officials at the FDA and CDC for what he said were premature comments. The cause of the salmonella was eventually linked to contaminated irrigation water in Mexico. Georgia’s poultry producers were stunned by the closing of several chicken processing plants this year, a severe blow to the $5.6 billion annual farm gate revenues produced by the industry, the state’s largest agriculture sector. Most dramatic was the shuttering of the Pilgrim’s Pride processing plant in Douglas, where 900 workers lost their jobs. Adkins says the plant where he sells his chickens is still operating and that, in a perverse way, the rising cost of fertilizer was helpful to poultry producers who sell their chicken litter, the droppings, on the open market. Still, poultry products marked a milestone in 2008 when the commodity was named the number one agriculture export out of Georgia ports. Exports of Georgia products continue to be an important part of the state’s ag economy, thanks to an aggressive marketing program overseas anchored by a savvy sales office. Georgia has agriculture trade missions in Asia, Europe and the Middle East and the state’s top ag man, Tommy Irvin, is looking for other foreign markets. Few Georgians study foreign trade trends more intently than the state’s cotton farmers, who ship about 70 percent of their crop overseas. “China is our biggest customer, but they have not bought as much as in past years,” says Colquitt County cotton grower Louie Perry, chairman of the Georgia Cotton Commission.